Looking for a solution that will help you create awesome dashboards from your own data? You want access to everything from your database, your CRM, your ERP, your Analytics tool, or any other file that can be read by a standard spreadsheet platform? You just found the right solution: DashThis! You can connect one of our built-in integrations; or, if you prefer, you connect your own custom data into our tool using our automated CSV file uploading. Either way, you get all your most important data straight into our system! You’ll be able to create beautiful charts and graphs to display your most important KPIs. Create dashboards with your (or your client’s) logo, incorporate sections, and display your most important KPIs with a variety of graph and charts. 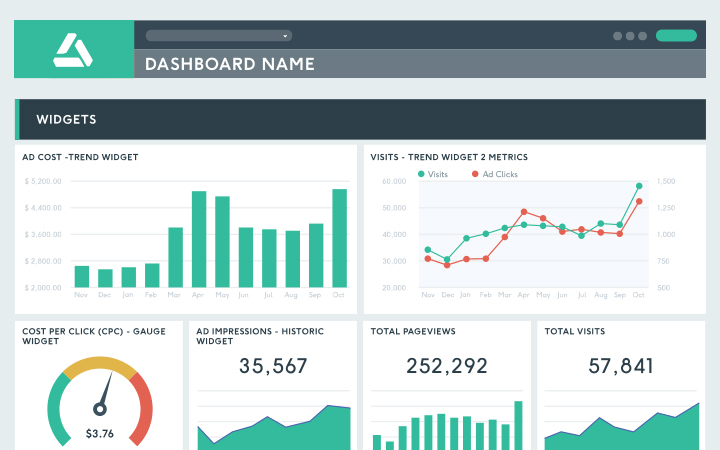 Show trends and add insights to your dashboards. Basically, make it look as awesome as your results! Make sure your dashboard gets the visibility it deserves! Access your data dashboard through a fully secured URL, automate your report distribution via email, or download it in PDF format to keep it on file. DashThis already supports many integrations. Google Analytics, Facebook, AdWords, MailChimp… we have over 30 integrations to help you gather the data you’re tracking in the most commonly-used digital platforms. But we know; you probably need more than these to get ALL your data into DashThis. This is why we’ve built a CSV integration too! Just plug your file into your DashThis account, and you’ll be able to create every possible type of widget in your dashboard. You can even automate the sending of your files to our system and we’ll update the data in your dashboards on our end! Most dashboarding solutions will provide you with pretty much the same features. But we aren’t like the others. Our core values are simplicity and awesome customer support for every single user that crosses our path. If you need help with our tool, if you have a question about dashboards, or if you just want to chat about digital marketing, don't hesitate to reach out! We’re here to make sure you not only get the best dashboard, but also the best experience. At DashThis, people come for the tool and stay for the people. Intuitive design, simple customization, numerous sharing options, and multi-user support: this is our core offering. Don’t forget that you get your own dedicated account manager no matter the plan you choose. Oh, and no coding or IT specialist required. Pretty sweet, right? We truly believe that you should pay only for what you need. Our pricing model is based on the number of dashboards you need; not on the number of data sources, or the number of users in your account. You just pay for the number of dashboards you need. That’s it. Plus, every feature we have is included in every plan. And yeah, our awesome customer service, by your very own account manager, is also always included. Replace the standard DashThis report URL with one branded to your company (dashboards.yourcompany.com maybe?). Get a fully personalized white label dashboard design that reflects your brand's colours, fonts, and overall vibe. Save on a custom URL and design with a white label bundle that includes both! A data dashboard just the way you want!